A DAZZLING display of festive illuminations has made the Ashurst family home the winner of the Mail’s Light Fantastic competition. 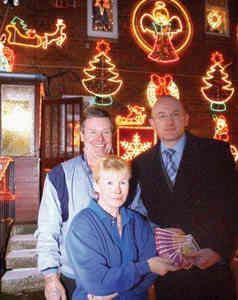 Bob Ashurst, 61, and his wife Hazel, 53, of Lilac Crescent, Trimdon Station, have been lighting up their home for the past eight years. But they have surpassed themselves – and all the others entrants in the Light Fantastic competition – this year. They collected their prize of £100 worth of Woolworths vouchers from Mail editor Paul Napier yesterday. Months of hard work have gone into making the Ashurst’s house a talking point for miles around. The walls of the house and almost every inch of garden space are occupied by Christmas lights, a display Mr Ashurst believes puts about £5 a night on the family electricity bill.